Logistics incumbents have been rather slow in adapting to the intense competition from new digital business models. Well-funded startups and technology giants such as Amazon, Alibaba and Google are disrupting the industry along its entire value chain. They are making substantial advances in big data analytics, AI and machine learning to quickly scale up asset-light logistics solutions. Companies like Freightos and Flexport build online freight-forwarding platforms, Temando develops a modern warehouse & inventory software, Virtenioutilizes IoT solutions to track goods throughout the entire supply chain. Others like Magazino and Fetch Robotics manufacture automated picking robots, Fieldbit develops an entire knowledge ecosystems for worker wearables. At heart, they all have one thing in common, they are capitalizing on the large amount of data that is created by the high number of transactions along the supply chain. After some rather slow years, VC investments in supply chain & logistics startups took off in 2014, when the overall funding doubled compared to 2013. In 2016, CB Insights tracked funding of $5.3bn that was allocated throughout 315 venture deals. VCs continue to be optimistic about the technology and efficiency gains startups are bringing to this lucrative but still very much offline industry. The bulk of the money is being invested in startups that close the gap in the digital supply chain, increase safety measures, diagnose issues remotely and analytics software that utilizes the large amount of data generated by logistics companies. 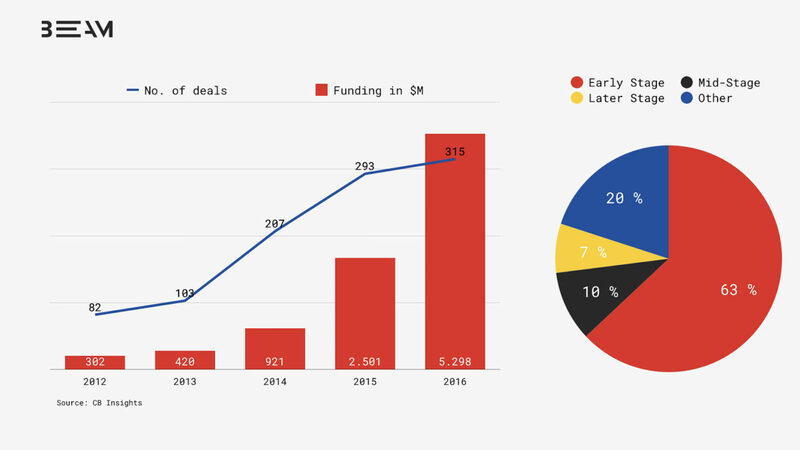 Seed/angel and Series A investments have accounted for over 60% of deal share since 2013, while mid-stage funding (Series B and C) accounted for 10%. As early-stage startups need at least 5 years to reach a certain maturity, these numbers strongly suggest that we are still in the early phase of the digital disruption of the logistics industry. The opportunities and challenges involved in digitizing logistics are reflected quite well in the area of freight and cargo transportation. You have the top five forwarding companies, incl. DHL, DB Schenker, Kühne+Nagel, making billions in revenue per year, but they still only hold 8% of the entire market. The rest is handled by over 700,000 smaller forwarders in Europe. To give you an idea of how small these companies are that the entire logistics industry relies upon. In Germany, there are 45,000 of these forwarders with an average of around 3 trucks per company. Startups are introducing technology that connects the long tail of delivery providers directly with customers in order to build more seamless logistics processes that move goods from any point A to B. These startups do not own any assets themselves, but their approach of fragmenting existing supply chains helps to upgrade operational efficiency and transparency, all while complementing the incumbent’s legacy capabilities. Where does Beam fit into all of this? We are a company builder based in Berlin, backed by BEUMER Group – a family business and one of the world’s leading intralogistics companies. We identify non-obvious, but substantial business opportunities. Together with founding teams, we launch three logistics-focused software companies per year to address these challenges. If you want to build something that will transform the logistics industry, we are very eager to meet you. You can reach us at hello@beamberlin.com. To give you an overview of the logistics startups out there, we have compiled this list with logistics startups we think are worth knowing. If you think we missed a one, please feel free to submit it via this form.